Ever since I was a child I've pretty much idolised two superheroes in my life. Sure I'm a self-confessed comic book geek, read the medium as much as I would a simple paperback and very much versed in the worlds of both Marvel and DC. But of the countless array of characters both have given the world over the past 70+ years, two have stood out above all. One is Batman and the other is Spider-Man. Unlike The Avengers which has taken the world and box offices by storm since it came out back in April, and The Dark Knight Rises which fans have been waiting for since they left the cinema seeing its predecessor in 2008, expectation around The Amazing Spider-Man has been somewhat modest at best. Rebooting a phenomenally successful film saga just five years after the third instalment came out seems a bit drastic to the most cynical of eyes, but then if you were unfortunate enough to catch Spider-Man 3 in the cinema you wouldn't exactly blame them. For the few who haven't; it wasn't exactly Batman & Robin bad, but in hindsight it perhaps wasn't far off. So out goes Sam Raimi and Tobey Maguire and in comes the younger, hipper Marc Webb (director of 500 Days of Summer) and Andrew Garfield in the title role. 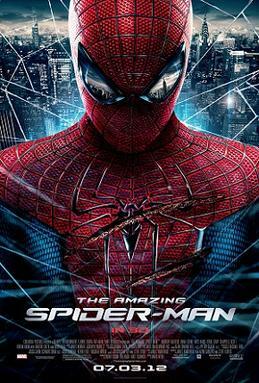 Like the original Raimi film, The Amazing Spider-Man concentrates on the famous web-slinger's origin story, although in a slightly darker and less colourful setting than the original. Peter Parker the socially awkward science nerd is replaced with Peter Parker the geek chic, photographer kid from next door. However the chips on his shoulder very much remain. The story, at its core, delves into Peter's struggles for a father figure ever since his parents (extremely brief but welcomed appearance of Campbell Scott and Embeth Davidtz) left him as a child and realising the hard way the responsibility of becoming a real hero. Unlike the Raimi films, Webb uses this opportunity to stretch out Peter's high school life which were skimmed over in the first 20 minutes of the original film. Here we see him meet his real high school sweetheart Gwen Stacey (Emma Stone), come to blows with her over protective, police officer father, George Stacey (Denis Leary) and develop a working relationship with his father's former lab partner Dr Curt Connors (Rhys Ifans) who eventually turns into the villain of the piece known as The Lizard. Instead of using the noticeably comic book like vibrancy of the world Sam Raimi created in the original trilogy, Marc Webb opts to take some of his cues from the Christopher Nolan school of rebooting superheroes. You're bound to know the routine by now; slightly gritty with a lot of 'real world' grounding (roll your eyes accordingly if you've heard this one before...). And the story largely falls in line with this, The Amazing Spider-Man doesn't necessarily come out all guns blazing with spectacle, but more than makes up for it with the care and attention given to Parker's journey into the hero with great power and great responsibility. Garfield was terrific in the title role, he attained Parker's sympathetic qualities and angst while still enabling himself to turn on the charm, wit and sarcasm while donning the red and blue spandex of Spider-Man. He also does a great job of reminding the audience every so often something we tend to forget when we think of Spider-Man, he is essentially still a kid at the beginning of his journey. He's brash, he's fearless, he's occasionally a bit selfish and petulant and this rings true in the moments when he first becomes Spider-Man and in a couple of run ins with resident school bully Flash Thompson (Chris Zylka) - both before and after he gains his powers. It's hard to not love Emma Stone in whatever role she plays these days, and her portrayal as the charming, graceful, bubbly Gwen Stacey is no different. The scenes she shares with Garfield are some of the films true highlight's, and clearly where Webb - having found success in this formula with the brilliant anti-romantic comedy 500 Days of Summer - felt most at ease. Webb's handling of The Lizard must be commended despite a lot of clumsy CGI renderings which disjointed the feature at various points. Next to The Dark Knight, Spider-Man probably has the most memorable and impressive rouge gallery in comic books. Opting to use The Lizard echoed Nolan's use of The Scarecrow in Batman Begins in many ways, it was a frightful antagonist to inject a bit of fantastical flair into the film, while also the villain's Jekyll and Hyde duality and circumstance was a way of bringing the hero into the larger world of his own universe and the potentially bigger sequel to come. Where The Scarecrow brought Batman into the world of Arkham Asylum and all the psychotic inmates with it, The Lizard brought Spider-Man in line with potentially the next film's major villain Norman Osborn/Oscorp; whom turns into arguably Spider-Man's main nemesis, The Green Goblin. While there's no J Jonah Jameson in The Amazing Spider-Man to steal the spotlight this time round (John Slattery for this series, Marc? Yeah? ), the supporting cast of Leary as Captain Stacey, Martin Sheen as Uncle Ben and the ever elegant Sally Field as Aunt May were terrific. No matter how many times you see it, no matter how many different camera angles in how many different movies, the imagery of Spider-Man swinging around the skyline of New York will still give fans of the films goosebumps, more so when put next to the majestic soundtrack scored by James Horner. Whereas some of The Lizard's CGI was disappointing, Spider-Man's felt much more authentic. During production Webb decided to shoot as many practical scenes of Spidey web-slinging as possible and in the final cut the difference is striking. It's simply a shame he didn't use some practical prosthetics for Ifans' Lizard too. Like Webb's previous film, the use of music played a huge part, more so than perhaps any comic book film I've seen in quite some time. It was littered with emotional, grungey, singer songwriter montages. Some core audiences might find this distracting but I think, for the world Webb is creating, it lends itself wonderfully to the imagery. The Amazing Spider-Man largely lives up to its own billing. Andrew Garfield gives a compelling account of the personal woes - and there's a lot of them - inflicted upon Peter Parker in his journey to becoming the iconic web-slinger. While the set pieces don't live in the memory as much as some featured in the original trilogy, this film's general enjoyment, playful humour, romantic chemistry, darker themes and larger plan for its inevitable sequels will leave die hard fans begging for more. The Amazing Spider-Man is in cinemas everywhere now.